Tenth Doctor Coats: Back for Pre-Order Now! The Tenth Doctor’s Coat is back for Pre-Order in ALL sizes on AbbyShot.com! This is AbbyShot’s most popular coat so you know that sizes are going to move fast! 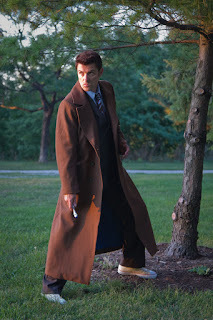 If you’ve been eying this fine Doctor Who replica overcoat it’s best to reserve yours ASAP. Pre-orders start now and coats will be delivered to new Time Lords in June. Please note that the retail price has gone up slightly for this restock (from $305 to $329) due to increased costs worldwide of manufacturing, fuel, and Dalek-fighting. Okay, maybe just the first two. I’m a huge fan of Doctor Who but I wasn’t getting this coat for any kind of cosplaying. I just love long coats and the Doctor had the coolest long coat I had ever seen. What I was looking for was a replica that would hold up to day-to-day wear and that is exactly what I got. Customer service is also a huge priority here at AbbyShot, so if you have any questions about choosing your size, please don’t hesitate to Contact Us! The post Tenth Doctor Coats: Back for Pre-Order Now! appeared first on .